Our Horses - Exceptional Equestrians of the Missouri Valley, Inc. Without our horses, Exceptional Equestrians would not exist. The bond that occurs between animals and humans is what makes equine assisted activities and therapies so successful! EE is lucky enough to have a herd of 13 wonderful horses. 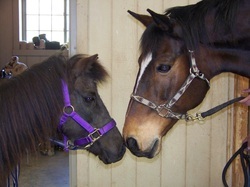 These horses have been donated or purchased and were specially selected for their temperaments, sizes and gaits. Our participant's abilities and skill levels are widely varied, but EE has a horse that's just right for each and every participant. Big Mac has a long history with EE. He was purchased by the program in 2004, and was the first horse ever owned by Exceptional Equestrians. For more than 10 years, he was the most well known horse at the barn, a beautiful Clydesdale with a sweet, but playful personality. In 2015, he developed arthritis that caused him to be retired, but in July of 2018, he returned to the program. Though Mac can't handle as many lessons as he used to, he is still a favorite with clients and volunteers, and does great with our independent riders. We're so happy to have him back at EE! Panda is a 10 year-old miniature horse. Panda lived with Big Mac at the LeBrell's Petting Zoo. When Big Mac came back to EE, he just had to bring his little friend along! Panda has a wonderful, kind nature and loves to be petted and brushed by our clients. Gabe is one of the most recognizeable horses at EE. He came to the program in 2011. He is an 15-year-old Haflinger who was donated by Elaine Homeyer. He has become a fantastic therapy horse. His fast gaits with lots of movement are a hit with our younger riders and his strong back allows him to carry a variety of clients. He's also REALLY cute! King is a 16-year-old Missouri Fox Trotter who joined EE in December of 2011, after being generously donated by Vic Beck. King's unique gaits allow our participants to receive different levels of sensory input, as well as develop self confidence and independence. King's beautiful, golden coat and patient attitude make him a favorite among everyone he meets! Liberty is definitely one of the most attention-catching horses at the barn! He is a 20-year-old paint gelding who was donated by program by volunteer Sandy Bailey. He is one of our most popular mounts due to his energetic gaits and flashy, paint coloring. Flying Colors Mach One or "Mach" is a 13-year-old Clydesdale who was purchased for EE by Cardinals Care and generous EE volunteers. Mach is being trained to be an interactive vaulting horse, and he does a wonderful job carrying some of taller riders. Mach is quite beautiful and all of our volunteers and clients can't stop admiring him! Flash is the newest addition to EE. He is an 18 year old sorrel quarter horse. Before coming to EE, Flash was a rodeo horse, participating in team roping and cutting. He is so eager to please and loves being part of program sessions. Oliver is a very special addition to Exceptional Equestrians. He came to EE in December of 2011. He is an 11-year-old Gypsy Vanner, and he was awarded to the program by the American Gypsy Horse Breed Association's Gypsy Angel Foundation. Oliver was bred at Chocolate Horse Farms. Oliver participates in all program activites, from vaultin, to licensed therapy and summer camp. Tove is a 14-year-old Norweigan Fjord who joined EE in October of 2016 along with barnmates Anna and Chance. Tove has been a fantastic addition to our program. She's strong, but short, making her easy to sidewalk. She's up to try anything, and will carry any rider we ask her to! Anna is a 17-year-old Norweigan Fjord who joined EE in October of 2016 along with barnmates Tove and Chance. You can tell Anna and Tove apart because their manes are cut differently. Anna had a career as a broodmare, but is learning to enjoy her new job. Anna is great for independent riders, with her nice, steady trot. Chance is a 23-year-old Quarter Horse mare gelding who came to EE with Anna and Tove. Chance has "been there, done that." He's great for EE because nothing phases him. Chance is fantastic on the trail and great for both independent riders and those with sidewalkers. His steady jog and rocking horse canter make him a lot of fun to ride. Chance is on loan from Meg Sorhus and South House Farm. Santares, or "Santa" is a 19-year-old Oldenburg. Originally imported from Germany, Santares came to us with extensive training and conditioning in dressage. Santa is used in our advanced riding sessions and for many of our taller clients. His riders love his big gaits. A strikingly handsome 10-year-old Clydesdale gelding, Striker was generously purchased and donated to the program by several of our kindhearted volunteers. Striker's sweet and kind personality make him a favorite among our volunteers. He loves playing games and going for walks on the driveway. Milo is an 16 year old American Warmblood, who came to EE in the summer of 2018. Milo is leased from Alyssa Weihe. His many years of experience as a lesson and dressage horse make him a favorite of our independent riders. Milo has a great attitude and gets along well with all our volunteers. Tercio came to Exceptional Equestrians in May of 2018. He is an 18 year old Andulusian who was bred in Spain. Tercio is owned by EE's Administrative Manager, but also enjoys being part of program lessons. His long forelock nd high-stepping gaits make him a favorite with program clients. Unfortunately, although we love all our program horses, they can't stay with us forever! Our goal at EE is that all of our horses have time to enjoy "being a horse" after they've worked so hard with us. With that in mind, we try to retire our horses when we feel they are no longer living their best life with us. We'll always remember our former program horses, including those who have moved onto new homes or back to their old homes: Remi, Otis, Chance, Doc, Patriot, Joey, Marley, Jim, Sweetpea, Apache, Captain, Rex, Elliot, Star, Quinn, Mr. Wishbone and Nixa; and those who have moved onto the greenest pasture of all: Cowboy, Rebel, PacMan, Boss, Rambo, Glock, Jack, Bear, Gypsy, Henri, Phantom, Heidi-Ho, Isaiah and Jameson. Would you like to contribute to these amazing animals? Adopt a horse!